To prove a statement P by contradiction, you assume the negation of what you want to prove and try to derive a contradiction (usually a statement of the form ). Since a contradiction is always false, your assumption must be false, so the original statement P must be true. Since I want to prove A by contradiction, I begin by assuming the negation . I'm trying to construct a contradiction of the form . I arrived at the contradiction at line 11. Therefore, I conclude that my premise was false, so A must be true (line 12). In the next example, I'll look at Euclid's proof that there are infinitely many prime numbers; it occurs in Book IX of Euclid's Elements, which was composed around 300 B.C. and is arguably the most famous math textbook of all time. x leaves a remainder of 1 when it's divided by , since divides evenly into the term. Likewise, x leaves a remainder of 1 when it's divided by , ..., . Therefore, x is not divisible by any of the p's --- that is, x is not divisible by any prime number. However, every integer greater than 1 is divisible by some prime number. A precise proof of this fact requires induction, which I'll discuss later. But you can see that it's reasonable. If a number z is prime, it's divisible by a prime, namely z. Otherwise, you can factor z into a product of two smaller numbers. If either factor is prime, then the prime factor is a prime which divides z. If neither factor of z is prime, you can factor them, and so on. Eventually, the process must stop, because the factors always get smaller. Returning to my proof, I've found that x isn't divisible by any prime number, which I've just noted is impossible. This contradiction shows that there must be infinitely many prime numbers. So . This contradiction shows that the original system has no solutions. The next example is another "classical" result. The discovery that there are quantities which can't be expressed in terms of whole numbers or their ratios was known to the ancient Greeks; Boyer and Mertzbach  place the discovery prior to 410 B.C. Suppose on the contrary that is rational. Then I can write , where . (Remember that stands for the set of integers.) By dividing out any common factors, I can assume that is in lowest terms (that is, m and n have no common factors besides 1 and -1). Now 2 divides the right side, so it must divide the left side. But if 2 divides , it must divide n.
However, I already showed that 2 divides m, so 2 divides both m and n. This contradicts my assumption that the fraction was in lowest terms. A proof by contradiction might be useful if the statement of a theorem is a negation --- for example, the theorem says that a certain thing doesn't exist, that an object doesn't have a certain property, or that something can't happen. In these cases, when you assume the contrary, you negate the original negative statement and get a positive statement, which gives you something to work with. Having said this, I should note that it is considered bad style to write a proof by contradiction when you can give a direct proof. In those situations, the proof by contradiction often looks awkward. Moreover, the direct proof will often tell you more. For example, a direct proof that something exists will often work by constructing the object. This is better than simply knowing that the object exists on logical grounds. 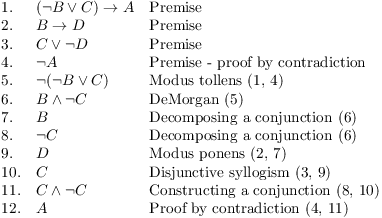 In some cases, proof by contradiction is used as part of a larger proof --- for instance, to eliminate certain possibilities. Example. Prove that the function cannot have more than one root. In this proof, I'll use Rolle's Theorem, which says: If f is continuous on the interval , differentiable on the interval , and , then for some . Suppose on the contrary that has more than one root. Then f has at least two roots. Suppose that a and b are (different) roots of f with . By Rolle's Theorem, for some c such that . Since is a sum of even powers and a positive number (17), it follows that for all x. This contradicts . Therefore, f does not have more than one root. Note: You could use the Intermediate Value Theorem to show that has at least one root. Combined with the result I just proved, this shows that has exactly one root. Example. On a certain island, each inhabitant always lies or always tells the truth. Calvin and Phoebe live on the island. \qquad Calvin says: "Exactly one of us is lying." \qquad Phoebe says: "Calvin is telling the truth." Determine who is telling the truth and who is lying. Suppose Calvin is a truth teller. Then "Exactly one of us is lying" is true, and since Calvin is a truth teller, Phoebe is a liar. Therefore, "Calvin is telling the truth" is a lie, so Calvin must be lying. This is a contradiction, because I assumed he was telling the truth. Hence, I've proved by contradiction that Calvin must be a liar. Hence, "Exactly one of us is lying" is false. This gives two possibilities: Either both are telling the truth, or both are lying. Suppose both are telling the truth. This contradicts the fact that Calvin is lying. The only other possibility is that both are lying. Then Calvin's statement "Exactly one of us is lying" should be false (and it is), and Phoebe's statement "Calvin is telling the truth" should be false (and it is). Thus, this is the only possibility, and it's consistent with the given statements. Therefore, Calvin and Phoebe are both liars. Carl Boyer, A History of Mathematics (2 edition) (revised by Uta Merzbach), New York: John Wiley \& Sons, Inc., 1991.